Most of us would agree that a discounted Gymboree gift card is as good as gold for any parent of a young child! With departments in boy, girl, toddler boy, toddler girl, baby, and sale, your little one will be cuter than ever, and for less money out of your pocket! After the first store opened in 1986, additional stores quickly followed. And for very good reason too. Known as the go-to place for adorable coordinating children’s clothing, their stores are still in demand! And with sizes ranging from newborn to size ten, they have the cutest clothing and accessories for every child. Any mother will tell you that these clothes are great. What’s more, with 630 retail locations, shopping for their adorable clothing and accessories is very convenient! Now, just imagine how great it would be to have a discounted Gymboree gift card! We understand how fast children grow and how expensive it can be keeping them in clothes that fit! And the great news is, now you can save money on some of the cutest, well-made children’s clothing available on the market! When you buy a Gymboree gift card, you will get more cute children’s clothing for less money. And we’re not just talking cute here, we’re talking adorable! Durable too! Their superior quality clothing is designed with kids in mind. Wash after wash, these clothes will last. In fact, they even fade less than other popular brands! And just think, with your discounted card, you will get more for the money! What’s more, because gift cards are a form of currency, all coupons, store promotions and exclusive offers remain valid! Join their rewards program for free, and receive 1 point for every dollar you spend. Later you can redeem these points for discounts on your next purchase! Your baby will be looking and feeling great- without breaking the bank! Not only will a discounted Gymboree Gift card save you money on your entire purchase of children’s clothing but these , but also.But that’s not all! Cards2Cash offers gift cards for many other clothing stores, restaurants, and websites. Make sure to check out our listings for Carter’s, Babies “R” Us, The Children’s Place and more! With Cards2Cash, looking great while saving money is a cinch! 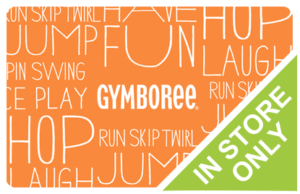 Do you have a Gymboree gift card you aren’t going to use? Turn that unwanted gift card into money in your pocket! Cards2Cash buys cards for a variety of shops and websites. If interested, visit one of our retail locations, for on the spot payment, OR fill out our online form, and we’ll get back to you quickly with an offer you won’t refuse. Cards2Cash is your one-stop gift card shop!